Crawling Under A Broken Moon #5 is written by Reid San Filippo and Sean Ellis. It is published by Shield of Faith Studios. This issue is dedicated to that "gonzo mishmash of fantasy and technology clashing together with imperfect harmony" that was the successor of Thundarr the Barbarian, He-Man and the Masters of the Universe! This article is an overview of the Aetherian land by Sean Ellis. Although it is only a single page long, people interested in the inspirational cartoon will hardly need more. Reid San Filippo and Sean Ellis provide a new character class which is appropriate for the setting. The class may use strange old technologies for its weapons and armor, and has an Honor Die to capture, as much as possible, the look and feel of the source material. "Long ago a rogue object flew between the Earth and the Moon, leaving chaos in its wake. Soon after, the Un Men appeared. A race of robotic warriors programmed with human consciousness, the Un Men seized what industrial resources remained in the northern Americas under a hail of blaster fire." Sean Ellis and Reid San Filippo provide a description of the technology created by the robotic Un Men, including power swords. "In the 22nd century, several objects struck this area from space, inciting volcanic activity and forming crater valleys and high ridges. The Dark Land is hazy with sulfuric clouds that obscure treacherous craters and bottomless pits." The enemies of Aetheria dwell in this waste, which is replete with subterranean tunnels hiding ancient horrors. Here dwells Skull-Or, the warrior lich that is the main opponent of the Aetherian setting. By Sean Ellis and Reid San Filippo. In this article, Reid San Filippo describes a magical, and intelligent, fortress that acts as a patron for non-magic characters. It also describes the Masters of Umerica, which anyone conversant with Masters of the Universe will find amusing at the very least. Statistics are not provided for these potent beings - every judge's Geek-O will be different! This issue provides full statistics for the Serpentoids and the Un Men. * Theszolokomodram the Thousand-Headed Hydra, the Unknowable Serpent Sage, the Observer of Realms, and the Many-Headed Master of Secrets. Ryan Moore introduces us to the Solar Saber, a techno-magical weapon created during "the dark times between the breaking of the world and the current age". It also has an invoke patron table and patron taint. This weapon is clearly inspired by the awesome 80's action of Thundarr the Barbarian. The Rockers are heavy metal elementals that are devoted servants of Kizz. Beware the unintentional injuries their mosh pit shenanigans may cause! All in all, you get more than three fully developed patrons in this issue, which is a pretty good bargain. This issue definitely builds off of what has come before, by defining Kizz, the Cyberhive, and Theszolokomodram, all of which are mentioned or described in earlier issues. 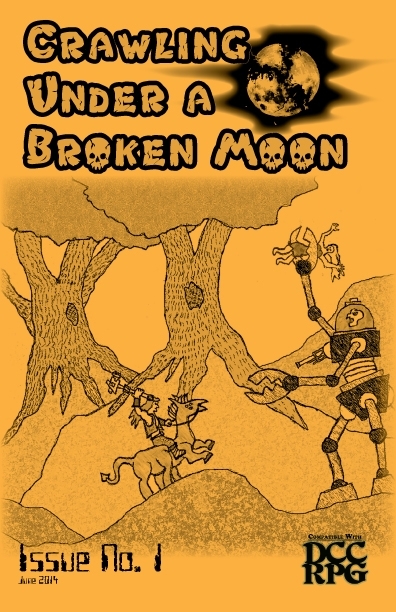 Crawling Under a Broken Moon #3 was written by Reid San Filippo and published by Shield of Faith Studios. In this issue we get rules for generating 0 Level characters suitable for exploring Umerica. This is pretty basic stuff, but all appropriate for the setting, and most players and judges will find it very useful. Of extreme interest is the mention of the Robot race (and class), which links to the Robot class described on the Mystic Bull website. The old link has expired; the class can now be found here. With local brigands coming to collect tribute, the 0-level PCs are sent into the ruins of a shopping mall to find it. I ran this adventure, and we had fun with it, but there was some dissatisfaction with the alternative XP rules used. They are designed to reinforce the intended action of the scenario, but my group was reluctant to accept them. Each judge should consider thier own group. Otherwise, a lot of coolness, including the first mention of two patrons: Theszolokomodra and the Mighty Kizz, His Most Holy Rock ‘n’ Rolledness. The introduction of Kizz as a deity led to a cleric of Freddie Mercury in my home game. This issue gives more details on creatures encountered in The Mall Maul: Malllocks, Pigtipedes, Trapdoor Toadspiders, and Vendibeasts. All of these creatures may be reused in further adventures. It is going to be almost impossible to look back at this issue, after Mutant Crawl Classics releases, and not compare the two versions of mutants. I have nothing but respect for the Umerica version, though, and I imagine that either type of mutant will be welcome in my own games. The "Mutant Origin" table is a nice touch! Naturally, now that you have rules for mutants, you will want to mutate some monsters. And, naturally, the Mutant class from the previous article makes it easy. Example creatures are the Falcon Wolf and the Mighty Tarasqu-Ape. Rules for all types of grenades, including bundles of dynamite, Molotov cocktails, and MicroNukes. Have fun! This issue introduces the Zombie Monks of the Cyberhive, the Robo-Lich, and the Mutitan. The first two are some of the best post-Apololyptic monsters yet released for Dungeon Crawl Classics, being nothing that would exist without either high technology or magic. With their interest in harvesting the dead, PCs might actually deal with them in some other way than just combat. I have used these critters in a game using Patrick Wetmore's Anomalous Subsurface Environment (originally designed for Labyrinth Lord), and the players were rather freaked out. Mutitans are "writhing masses of flesh with multiple limbs, torsos, heads, mouths, tentacles, and eyes. New appendages burst forth as older ones sink back into the flesh or are sloughed off." This issue describes the Floating Tower of the Cyberhive, which might seem like an interesting setting for an adventure...but it is one most adventurers would flee from! You might as well admit it: sooner or later, we all wonder what it would be like if a Borg Cube merged with The Tomb of the Cybermen on an episode of Thundarr the Barbarian! Crawling Under a Broken Moon #1, is by Reid “Reidzilla” San Filippo and is published by Shield of Faith Studios. I am not 100% certain off the top of my head, but I believe that this was the first "setting zine" for Dungeon Crawl Classics, to be followed by Crawljammer, Metal Gods of Ur-Had, and Black Powder, Black Magic. I imagine that if I am wrong, someone will correct me in the comments. 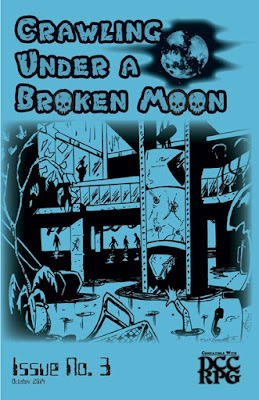 Crawling Under a Broken Moon does not begin with a 0-level primer. It jumps right into the action. This could be a problem for some judges, but there is no reason to not simply use this material with Dungeon Crawl Classics as it stands. I would like to also point out that this issue is really a work of love coming from a single source. Apart from editing by Jason Bossert, Reid did it all - cover art, interior art, and writing. 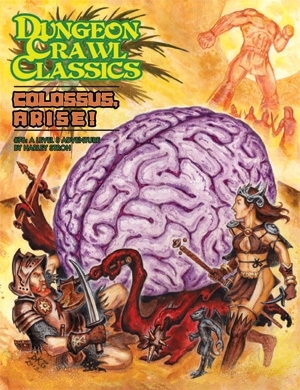 That understated cover carries all of the energy and enthusiasm of the early Judges' Guild materials, and is a good example of how individuals can open up whole new vistas with Dungeon Crawl Classics. And then share those vistas with the rest of us! Running adventures in a "Gonzo Post-Apocalyptic Fantasy World" takes a slight bit of adjustment. Table DDD: Found Item Condition Table is of particular use. This might even be something that a cunning judge could borrow for other Dungeon Crawl Classics settings....even the most standard settings might have a windmill or a windlass that has seen better days. The main setting for Crawling Under a Broken Moon is Umerica, a post-Apocalyptic version of the United States which allows for a wide range of adventures. Clearly, inspirations included cartoons like Thundarr the Barbarian, as well as earlier games such as the original Gamma World. It would be pretty easy to place adventures in the ruins of any continent or nation if you so choose. Described as a "class dedicated to the accumulation of scientific knowledge and power", this is more like a class dedicated to the understanding and use of ancient technologies. It's a good class, but it requires that the judge seed appropriate technologies in his adventures. That shouldn't be a problem when Crawling Under a Broken Moon. 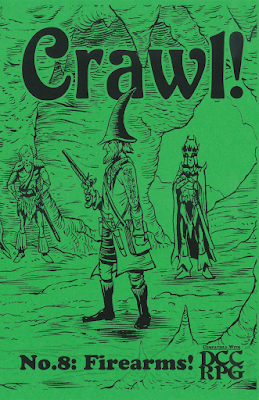 Obviously, guns are going to be considered important to the survivors of this twisted landscape, and Reid San Filippo provides an excellent set of rules summarized from articles by Reverend Dak and Mike Evans in Crawl! fanzine #8, used with permission. This first issue offers four creatures appropriate for adventures in Umerica. The Sharkhana are the descendants of shock troopers bred by aliens from sharks. They might trade if they are not hungry. They are usually hungry. Debris elementals are exactly what they sound like - elemental creatures created from the debris that litters the Umerican ruins. Although it does not appear in the description, I like the idea of a debris elemental that contains a vital bit of technology in its swirling mass of junk. The PCs would need to extract the goods, even if they failed to kill the monster. The sentrybot is a souped-up version of the security robots that are already being tested out in real life. They follow a strict program, and do not kill. Unless they are programmed to kill. Then all bets are off. The lobstrosity is an alien crustacean that seems to mix inspiration from Stephen King's Dark Tower series, H.P. Lovecraft's Mig-Go, and the garbugs of the 1st Edition Advanced Dungeons & Dragons Fiend Folio. The issue is rounded off with a description of Blooms Fashions, "a store with clothes to die for". If you are a fan of Doctor Who or Kolchak the Night Stalker, you should be able to add some fun details to this area, or expand it into an entire adventure! Crawl! fanzine Special: Van Den Danderclanden is written by Brett Miller and Reverend Dak, and published by Straycouches Press. 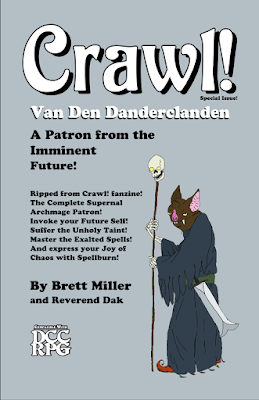 It is sort of a pain to have to use multiple zines for a single patron, so Straycouches Press kindly compiled the information on Van Den Danderclanden from Crawl! fanzines #1 and #3. One hundred years hence, in the most exalted of the parallel worlds, the great wizard Van den Danderclanden has at last attained the highest rank of his order: Supernal Archmage of Empyreal Aptitude! His sorcerous knowledge is legendary! The corruption he has suffered is profound! And yet, unsatisfied with the ceaseless praise of his legions of admirers and sycophants, the master enchanter endeavors a new enterprise. Employing the arcane arts passed down to him from Nyarlathotep itself, Van den Danderclanden reaches back through time and the multitude of parallel manifestations to contact his previous selves and their followers. He seeks to manipulate the paths of their lives in order to synchronize them to an existential resonance; the vibrations of such an alignment will serve to amplify his magical endowments and bestow upon him the mantle of godhood. This is the first third-party patron published for the Dungeon Crawl Classics role-playing game. Crawl! fanzine #12 (The Luck Issue) was written by Rev. Dak J. Ultimak, R.S. Tilton, and Mark Bishop. Mario Torres Jr. once again provides an excellent cover and interior art. This issue is published by Straycouches Press. Rev. Dak J. Ultimak offers tips for dealing with Luck Checks. Luck is one of the things that sets Dungeon Crawl Classics apart from many Old School games. People new to the game might need some basic guidance. Here it is. Note that the "Group Checks" sidebar is particularly useful. This article offers some good ideas for variations on rolling Luck Checks. It is written by Rev. Dak J. Ultimak. Rev. Dak J. Ultimak offers templates for awarding Luck based upon the type of campaign the judge desires. This article, by R.S. Tilton, offers a system for using Luck to allow any character to attempt Mighty Deeds, A Warrior or Dwarf can burn Luck to roll a higher Deed Die. Included are two "Dastardly Deeds of Deceit" and the opportunity for non-Thieves to backstab. What it says on the tin. Author not listed. Special tables for Recovering the Body, fortune telling, mishaps, and so on. Again, the author is not listed. I suspect that some judges are going to get a fair amount of mileage out of these. Bard songs by Mark Bishop. Disclaimer: I have an article in this issue. Crawl! fanzine #11 is "The Seafaring Issue". It is written by Bob Brinkman, Rev. Dak J. Ultimak, Daniel J. Bishop, and Sean Ellis. It is published by Straycouches Press. 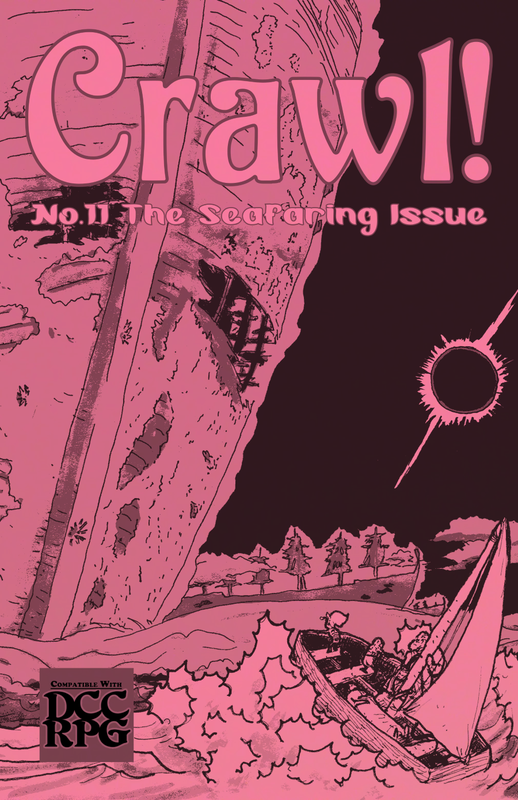 This is actually one of my favorite issues of Crawl! to date, and the artwork by Mario T. compliments the issue perfectly. Bob Brinkman makes his first Crawl! appearance with a vengeance, offering a complete system for resolving naval battles and statting up ships. This article alone is easily worth more than the cost of the zine. I would love to see this expanded upon, with many more ships statted out. It would be excellent. As a companion piece to the first article, Bob Brinkman describes Mighty Deeds one might use while at sea. Rev. Dak J. Ultimak offers a table of eight non-standard methods ships might use to get around. Fans of Jack Vance will recognize #4. In Portsmouth, sailors whisper of the deep elders, though few have ever met them. Designed to be used in conjunction with The Portsmouth Mermaid, this article describes servants of Dagon who possess non-marine creatures to do their Master's will. Included are rules to allow your players to continue running their possessed PCs. 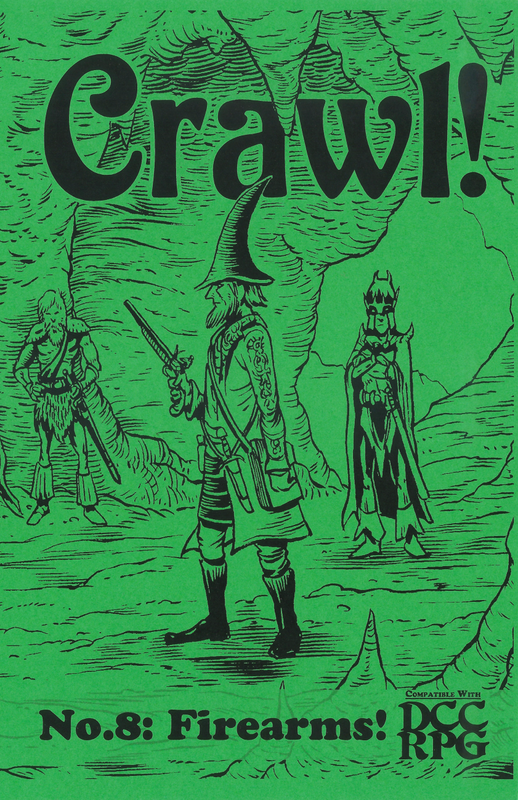 Finally, Sean Ellis provides an article, loosely based off Kirin Robinson's article in Crawl! #7, allowing you to run ocean voyages without hexcrawling. Basically, it allows you to skip the boring bits. Use when appropriate. This article is also, by itself, worth the cost of the zine. Crawl! fanzine #10 is written by Rev. Dak J. Ultimak, Jeffrey Tadlock, Daniel J. Bishop, Colin Chapman, Brad Littman, and Noah Stevens. It is published by Straycouches Press. The theme is "New Class Options!" You will remember how Crawl! fanzine #6 offered you some new classes? Well, Jeffrey Tadlock offers you an alternative to the race-as-class system Dungeon Crawl Classics uses for demi-humans. Your dwarf gongfarmer might survive to become a full-fledged Dwarf. Or she might become a Dwarven Priest. Similarly, your elf might become an Elven Rogue instead of just an Elf. Reverend Dak J. Ultimak supplies a new class. ...is followed by an alternative Halfling class, also by Rev. Dak J. Ultimak. Now, I actually have some problems with these classes. They seem to give extras to PCs at very little, or no, cost. If a Dwarven Priest is almost always superior to a Dwarf, why play a Dwarf? Likewise the Elven Rogue, and especially the Halfling Burglar. If you feel that the original classes are underpowered, this isn't going to be a problem for you. If you thought the original classes were relatively well balanced, you might be having flashbacks to AD&D 1st Edition, where the multiclassed demi-humans were obviously superior to your human fighter. Unlike AD&D, though, there is no XP penalty to even things out. This article is an optional multi-classing system which I created to answer the same problems that the three classes above sought (at least in part) to address: At some point, players ask why their halfling cannot become a thief. Or why their warrior cannot also become a cleric. The article, which was originally written with Crawl! fanzine #6 in mind, includes information for all the base classes, plus those introduced in that issue. The basic idea is to introduce some cost in exchange for flexibility. A series of charts to randomly determine physical traits, such as height, weight, and hair color, by Colin Chapman. This is useful not only for PCs, but to remind the Judge that NPCs should not all look the same. The final article is a "spotlight on three of many 3rd-Party races" compiled by Noah Stevens. A basic description is given of the Transylvanian Adventures Half Breed by Scott Mathis, the Avarian of the Hubris campaign setting by WrathOfZombies, and the Faerie Animal by Daniel Bishop, from Creeping Beauties of the Wood. Yes, that last one is mine. Crawl! fanzine #9 is The Arwich Grinder, which I wrote, published by Straycouches Press. Sean Poppe turned my original maps into something suitably creepy, and Mario T. matched the tone of the adventure with truly disturbing artwork. This is the darkest thing that I have ever written. When I finished the text, I had to get up and shake it off. The adventure is largely inspired by the works of H.P. Lovecraft, in particular The Case of Charles Dexter Ward, The Rats in the Walls, The Dunwich Horror, and The Picture in the House. I think I managed to create enough of the necessary horror - an actual pulling back from the ideas presented - to offer at least a dim echo of the Master's work here. I tried to create a sense of cosmic horror as well, though perhaps less successfully. This is, after all, a 0-level funnel in which it is abundantly clear that your PCs hold no special place in the universe. 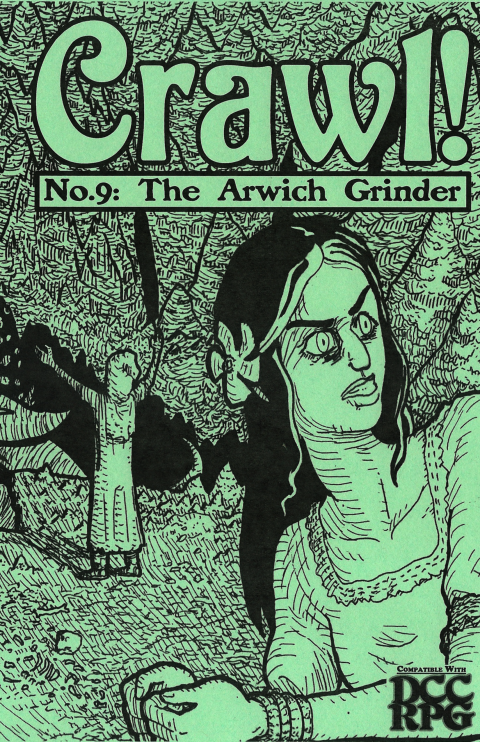 This might cause some to carve out their own importance, but in my experience, many players simply have their PCs slink away in the night, unwilling to face Arwich village with the shared horror of what they have done. On a brighter note, when I first ran this adventure in 2014 for my then-fifteen-year-old daughter and one of her friends, reports came back to me that I was "cool" because they told others about the adventure. I have considered writing "The Reverse Grinder", in which the PCs slaughter an innocent family because they imagine that they are in a Lovecraft-inspired funnel. My sense of humor is appalling. Also included, But He Sure Had Guts!, a gruesome short encounter that I originally wrote targeting Crawl! fanzine #5 (The Monster Issue). 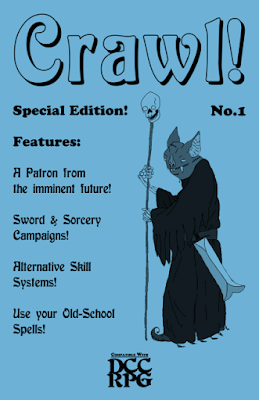 There is another short encounter I wrote and submitted at the time, The Urchin Gambit, which has yet to appear in Crawl! Crawl! fanzine #8 was written by Reverend Dak with additional writing by Mike Evans, Austin Schaefer, Christian Sturke, and S.A. Mathis. This issue, published by Straycouches Press, focuses on Firearms! 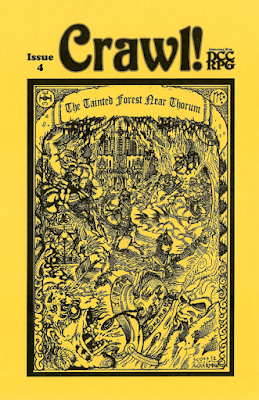 Unusually, this issue is also available as Hack!, designed for the Swords & Wizardry (and therefore other OSR) rules. I do not own the Hack! version. Actually, the Hack! version came about first, as Reverend Dak explains in the introduction, as the result of a Tenkar's Tavern post for Swords & Wizardry Appreciation Day. 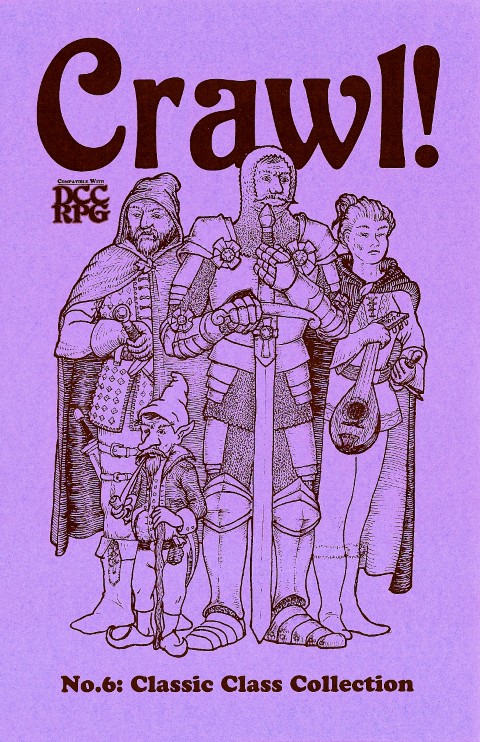 Either way, those of us playing Dungeon Crawl Classics certainly benefit as a result! If you get any singular firearms reference for DCC, this is the one to get. So, what's in this issue? Basic and optional rules for firearms. These are solid rules that help recreate the feel of using firearms in any campaign setting. Mike Evans and Reverend Dak take you from the "Era of Powder and Smoke" to the "Era of Lasers and Rockets" with full stats for various weapons and ammunition. An "adventure toolkit" that allows you to build an invasion of firearms users to bedevil your DCC PCs. Appendix I: Invaders! - Mike Evans provides stats for five groups of invader, ready to be used in your adventures. Appendix R: References - What it says on the tin. RPGs that use guns, which can be used for reference. Appendix S: Submissions - The Six Shooter, an artifact-caliber revolver by Austin Schaefer and simple rules for Explosives and Bombs by Christian “Rorschachhamster” Sturke. Appendix T: Firearm Crit & Fumble Tables - Provided by S.A. Mathis of Transylvanian Adventures fame. Crawl! 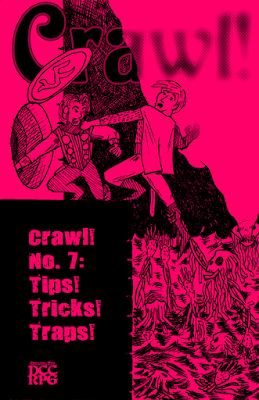 fanzine #7 (Tips! Tricks! Traps!) was written by Kirin Robinson, Thom Hall, Sean Ellis, Jeffrey Tadlock, Jürgen Mayer, and Paul Wolfe. It was published by Straycouches Press. Advice on using mazes by Kirin Robinson: "The actual playing of being lost in a maze is pretty difficult to make not boring. It’s a challenge of finding the right balance between wanting to foster a sense of growing frustration and dread against the potentially annoying or even boring repetition of escape denial." Thom Hall provides rules founded in the (open) source code for Nethack, allowing for fountains ala Rougelike computer adventure games. Now they can appear in your pen-and-paper tabletop games. Sean Ellis, who already turned his eye towards kobolds in Crawl! #3, and goblinoids in Crawl! #5, gives some ideas for making ogres more interesting. Some traps make attack rolls against the PCs. And sometimes those attack rolls are natural "20"s. Jeffrey Tadlock provides some sample traps, and a critical hit table for traps of all types. "The Shadowsword was forged from the shadow of the demon Ith-Narmant, who resides on a world circling a black sun where only ghosts, demonspawn and creatures of the night can prosper." Jürgen Mayer provides a Dungeon Crawl Classics magic sword your players will not soon forget. This is a good example of what a magical DCC blade should look like. Paul Wolfe considers what character occupation means for adventuring skills known. Disclaimer: I produced a piece of art for this issue. Apart from that slight blemish, the art in this issue (produced by Mitchell Hudson, Jason Adams, Count Spatula, Tomi Baranya, and John Becaro) is outstanding. Crawl! fanzine #5 (Monsters!) is written by Reverend Dak, Shane Clements, Sean Ellis, Jeff Rients, Jeremy Deram, Brad Littman, and Colin Chapman. Crawl! is published by Straycouches Press. Modify your monsters by giving them class levels, similar to those enjoyed by the PCs. This article, by Reverend Dak, offers judges who care about those sorts of things an easy way to create versions of classed monsters whose class abilities roughly parallel those of the PCs. The math involved is easier than, say, Pathfinder, but I prefer to simply make those decisions on the basis of what feels right. If you want more guidance, this article is for you. Shane Clements offers a Dungeon Crawl Classics orc class that appears to be based of the 3rd-edition era Dungeons & Dragons orc (although the illustration is pure 1st Edition AD&D!). This class would be easily adaptable to any sort of barbaric humanoid...including human berserkers (if you ditch the infravision). Originally published at People Them With Monsters, Jeremy Deram offers a quick "cheat sheet" for creating your own monster stats. Again, this article can help give the prospective judge some guidance. Sean Ellis provides alternative versions of goblin-type humanoids. This article, by Jeff Rients, is exactly what it says on the tin. The charts are provided for up to five dungeon levels, effectively ranking the monsters in the Cyclopedia of Creatures roughly by power level. Two original monsters by Brad Littman, one of which is clearly inspired by Jim Henson's Labyrinth, and the other by the moving stones of Death Valley in California. Colin Chapman offers the blood hound and the gloom hound. The nicest thing about the monsters offered by Brad and Colin are that, to me at least, it is immediately possible to see how they could be used in an adventure or a campaign milieu. Disclaimer: I received a "special thanks" from the author, along with several others, for proofreading and/or playtesting the adventure (proofreading in my case). Crawl! 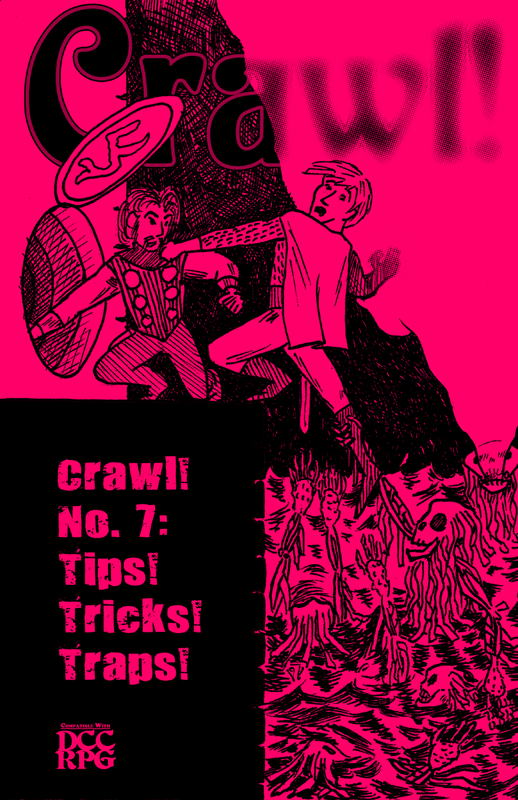 fanzine #4 is the first adventure published by Crawl!, and the first adventure in a Dungeon Crawl Classics zine. 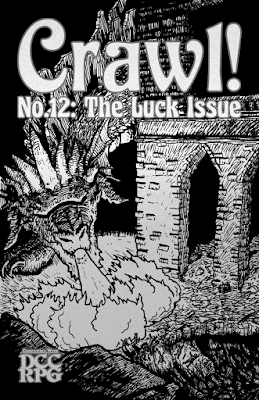 It is also the first published Dungeon Crawl Classics adventure to feature a dragon! This issue is The Tainted Forest Near Thorum, a 5th level adventure by Yves Larochelle. Crawl! is published by Straycouches Press. Additional Writing by Reverend Dak. 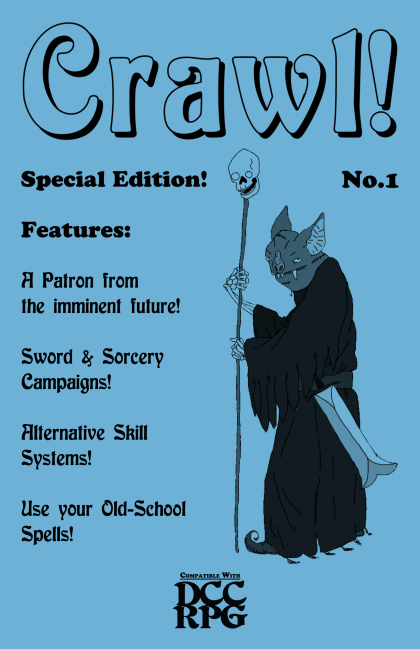 This is the only issue of Crawl! to date where the cover is not attached. Instead, it is removable to reveal a map of the village of Thorum and its environs. Nothing more can really be said without spoiling the adventure. There is something going on near Thorum, and the PCs are drawn into determining exactly what that is. Disclaimer: I produced some art for this issue, as well as some writing. Crawl! 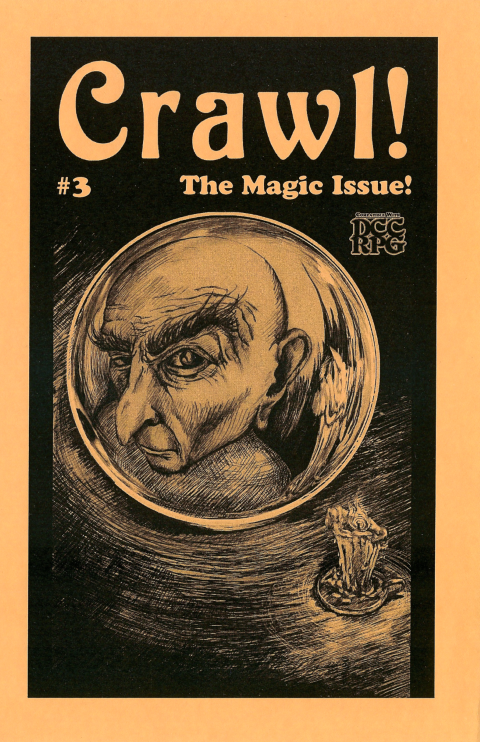 fanzine #3, the Magic Issue, was written by Reverend Dak, Sean Ellis, Brent Miller, Daniel J. Bishop, Jon Wilson, and Colin Chapman. It was published by Straycouches Press. The complete patron write up for Van den Danderclanden is included free with the pdf version. If you read the Dungeon Crawl Classics core rulebook, you will know that NPCs do not have to be treated like PCs in the system. In this article, Reverend Dak offers a simple system for statting up those NPC spellcasters from other OSR games, and for resolving their spells. Sean Ellis provides a kobold based on folklore rather than the traditional Dungeons & Dragons reptilian humanoid. Brett Miller scribes Van den Danderclanden’s patron spells and Spellburn results table. This is my version of the 4th-levelWizard Spell, Magic Wand. This is also the article I did the illustrations for. Jon Wilson’s article describes items that can adversely affect spells while they are being cast. This is an immensely cool idea that can make life difficult for your spell-slinging PCs. Alternatively, the PCs might need to seek out an anti-magic talisman to stop the machinations of a potent wizard, elf, or cleric. The core rulebook lists fourteen physical manifestations for familiars (per alignment); Colin Chapman brings this up to 20. Disclaimer: I did a couple of small pieces of art for this issue. 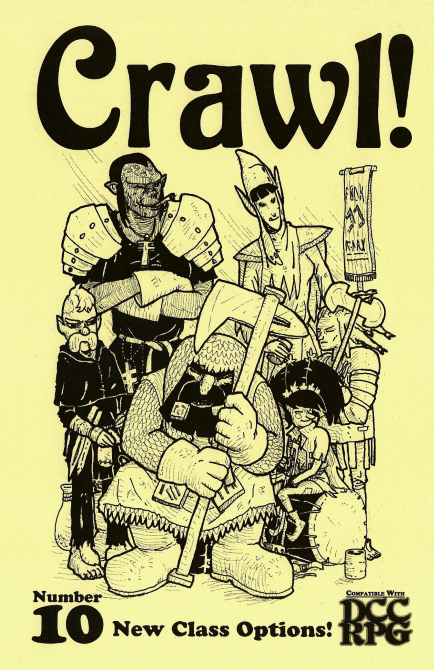 Straycouches Press continues with Crawl! fanzine #2, the Loot Issue! This issue was written by Rev Dak, Colin Chapman, and Jon Marr. 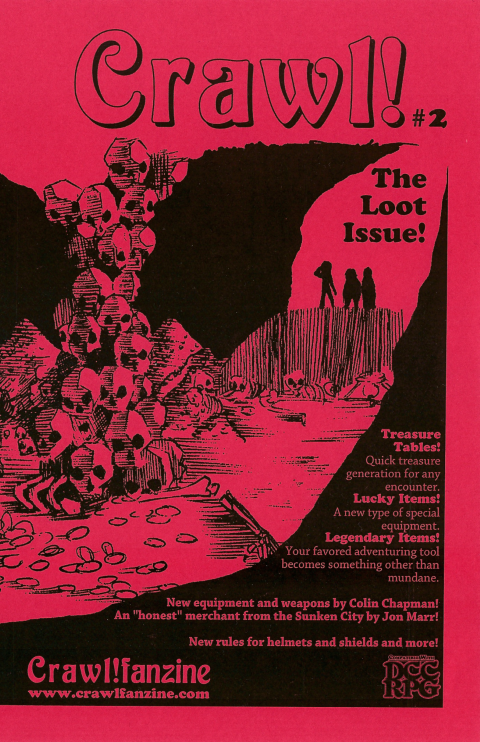 This was a fantastically useful issue, which I once listed as the second most-important must-have non-adventure product for Dungeon Crawl Classics. A random generation method for DCC treasures. This includes gems, jewelry, and magic items. Items with their own Luck score that can be burned. An article describing how items might become enchanted through the things the PCs do with them. 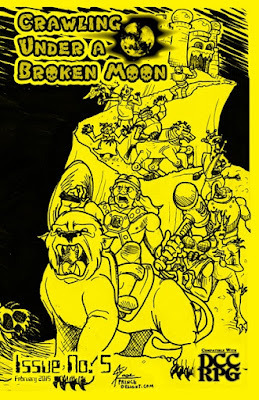 This article provides tips on converting treasure from other OSR game adventures to Dungeon Crawl Classics. Jon Marr provides a personality from the Sunken City who can help you monetize those weird items you found. The OSR "Shields Shall Be Splintered" rule (attributed to a blogger called Trollsmyth) for Dungeon Crawl Classics. This is one of the two articles I drew an illustration for. Rules to making wearing a helmet have actual value in Dungeon Crawl Classics. This is the other article I drew an illustration for. More than a dozen new weapons. New equipment for Dungeon Crawl Classics - an extremely handy reference to keep near the table. Sooner or later, your PCs will need shovels, skis, a wooden peg leg, or something else author Colin Chapman remembered to pack! The original Dungeon Crawl Classics zine, Crawl! fanzine sprang into existence in 2013, not long after the game itself saw the light of day. 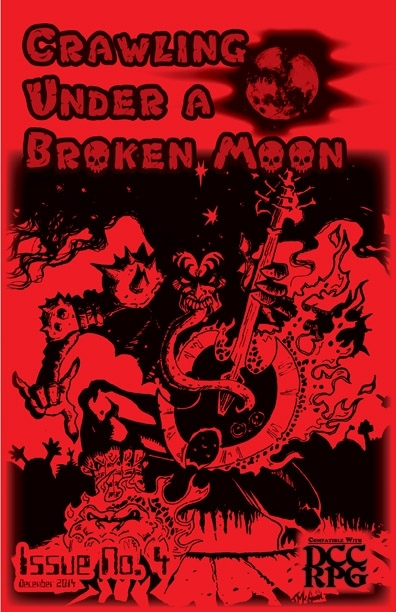 The first issue was written by Reverend Dak and Brett Miller. Crawl! is published Straycouches Press. The zine contains several articles. This article discusses ways to make DCC seem more like the "Pulp Fantasy and Swords & Sorcery Campaigns" of Appendix N fiction. Everyone is human, there is no cleric, and all the PCs have some thief skills. What if your patron was an aspect of yourself from one potential future? 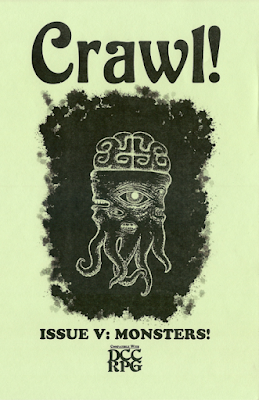 This is the first third-party patron published for the Dungeon Crawl Classics game. A variation on the bleeding out rules in the core rulebook. Dungeon Crawl Classics has pretty simple rules for skill checks. This is an equally simple way to make the DCs for those checks a little more random that 5/10/15/20. The "Class Skill Die" is a good idea, which follows pretty intuitively from the concept of Deed Dice and Luck Dice for thieves. Imagine that you are in the early days of Dungeon Crawl Classics, and there aren't as many DCC adventures out there as there are now. What do you do? Use older adventures, of course! What do you do about the spells in those adventures? Rev Dak has you covered! I personally use non-DCC adventures all the time, including things like Death Frost Doom for Lamentations of the Flame Princess and Barrowmaze, Stonehell, and Anomalous Subsurface Environment for Labyrinth Lord. This article was of tremendous help in the early days of doing so. Finally, when you buy the first issue of Crawl!, you now gain the complete Van Den Danderclanden as a separate pdf booklet. We didn’t have 8th level PCs hanging around in my campaign, so we made some. Really, I should have waited for Colossus, Arise! to be worked organically into ongoing play, but there are limitations to my patience. The adventure rocked! Starting this adventure, the PCs are literally sneaking through a lost city in the desert inhabited by an army of giants. If you have not read the entry for giants in the Cyclopedia of Creatures in the core rulebook, go ahead and do so. Take a gander at what giants do for critical hits. Then be afraid. Be very afraid. Now, here’s the weird thing. When I ran this, my players were not so very afraid. They took to the adventure like they were invincible. And, seemingly, they were, despite every die roll occurring in the open. And there is a real chance for some really serious action to go down here. Multiple chances for critical hits from giants. A 300-foot un-dead Chaos Titan making wildly random attacks. Strange magics. 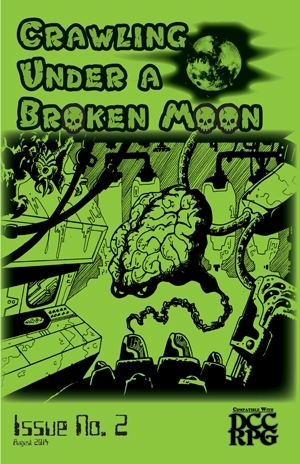 The brain on the module’s cover. Protected by Fate and the blessing of the Dice Gods, my players sailed right through it. And this is the really great part about Dungeon Crawl Classics: They loved it anyway. They knew that the dice were with them. They knew that things might have worked out otherwise (but how far otherwise they never learned). I think I might dust this one off for another run. Giants stalk the shifting sands as the lost city of Stylos awakens from its deathless slumber. The Fourth Age of Man is at hand! All that stands between the gigantic hordes of Stylos and their conquest of the world is your band of adventurers. Sinister traps, implacable foes, and the crushing tread of the dread Colossus all lurk within these pages, eager to test the courage and cunning of even the most accomplished adventurers.